Gamma’s Acuity UV Flatbed is the latest solution to affordable sign printing and board printing requirements. Gamma offers maximum flexibility and quicker turn-around times for board printing, including outdoor signage, trade show signage and direct-to-substrate printing. The Acuity prints direct to a vast selection of materials up to 2″ thick, creating stunning glass signs, metal signs, wood signs and recyclable board signs. Our newest printer, the HP Latex R1000 prints well to coated and uncoated materials, from papers and vinyls to backlit films and textiles. Its ability to print to materials that are flexible and stretch – vinyl film for auto wraps and fabric banners for display, for example, is unsurpassed. The output can be rolled, cut or used immediately. Equally important to the quality of printing is the environmental impact of the HP’s inks: they are eco-friendly both in terms of ink disposal and incineration of used prints.Our newest printer, the HP Latex R1000 prints well to coated and uncoated materials, from papers and vinyls to backlit films and textiles. Its ability to print to materials that are flexible and stretch – vinyl film for auto wraps and fabric banners for display, for example, is unsurpassed. The output can be rolled, cut or used immediately. Equally important to the quality of printing is the environmental impact of the HP’s inks: they are eco-friendly both in terms of ink disposal and incineration of used prints. Direct-to-substrate printing is a cost-effective alternative to traditional silk screen and photographic processes. Eliminated is hand mounting and labor costs which saves time and money. Gamma uses durable two-year inks that are weather resistant and won’t fade. When printed on outdoor materials like Sintra, Coroplast and Styrene, our inks cure instantly and do not require lamination. Unlike other flatbeds, Gamma’s sign printing produces near photographic quality with smoother skin tones and finer line definition. 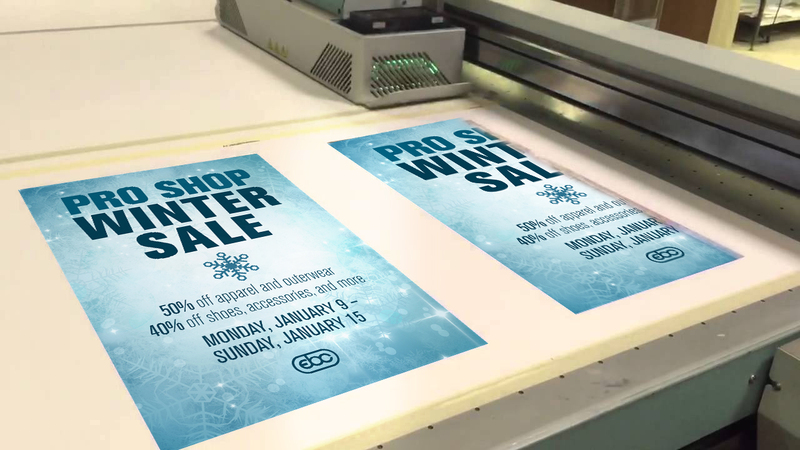 The Acuity and HP’s ability to jet droplets as fine as 6 picoleter creates trade show graphics usually seen at resolutions of 1,200 dpi or higher.